Posted on January 30, 2019 by Genezaret Quintana. This entry was posted in Whole U Program Information and tagged events, February Events. Bookmark the permalink. 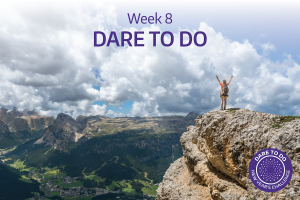 If the month of February is like a bridge between winter and spring, The Whole U has a range of activities planned that will help get you where you’re going—whatever your intended destination. 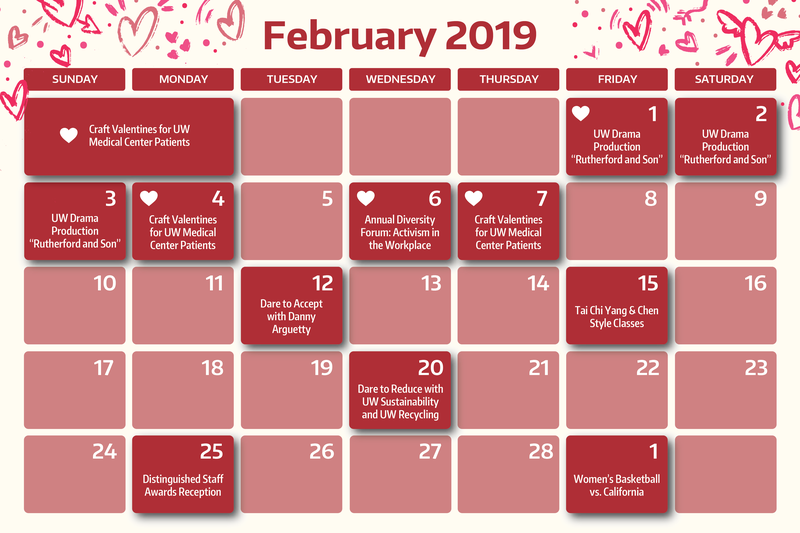 This February is full to bursting with events aimed at improving physical and mental wellbeing, giving back to those in need, and enjoying campus cultural offerings. Then stay tuned next week for a full coverage of UW happenings around Black History Month! 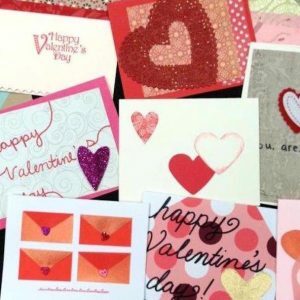 Make someone’s day and join the UW Medical Center’s Art Program and The Whole U over four card-making events for the annual Valentine Card Project. With a goal of creating 550 handmade Valentine cards for all UW Medical Center inpatients, make sure to drop by at any of the windows below! For only the third time in US history, the UW School of Drama presents Rutherford and Son, a transformative work of contemporary feminist drama authored by Githa Sowerby. 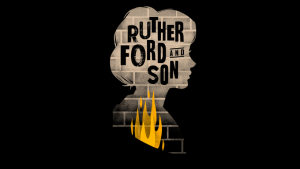 Produced in London in 1912, Rutherford and Son challenges a patriarchal society in light of family treachery and big business, allotting the play a spot in the National Theatre’s list The 100 Most Significant Plays of the 20th Century. Tickets. Join the Foundation for International Understanding Through Students (FIUTS) as they host their annual CulturalFest, kicking off with a performance showcase of the University of Washington’s best artists, musicians, singers, dancers, and choreographers from around the world to celebrate the abundant diversity of international talent in our region. Buy your tickets and checkout the lineup here. 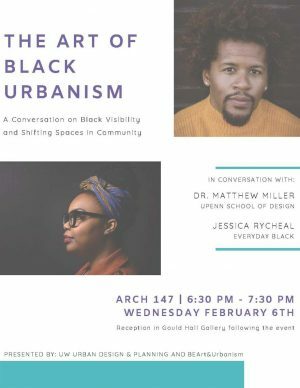 Join the UW Department of Urban Design and Planning and BEArt and Urbanism for a conversation on black visibility and shifting spaces in communities. The discussion will be led by Dr. Matthew Miller, UPenn School of Design, and Seattle artist Jessica Rycheal, Everyday Black. After the discussion, there will be a reception and an exhibit showcasing both of the artists’ work. Register here. Hosted by The Whole U and the Professional Staff Organization (PSO), the 2nd Annual Diversity Forum is proud to welcome all faculty and staff. 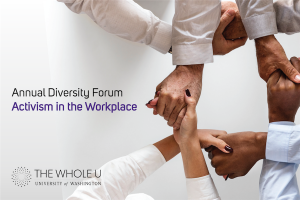 Leading a forum discussion on conducting civil and productive conversations surrounding diversity and activism in the workplace will be Terryl Ross, Assistant Dean for Diversity, Equity & Inclusion for UW College of the Environment, and Juanita Ricks, head of programs in School of Public Health. Register here. 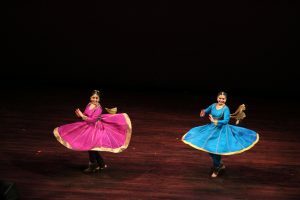 Experience the world at this international expo, where there will be representation of over 35 cultures through music, dance, food, conversation, and interactive activities. Whether you’re looking to bring your school group, family, or friends, you’ll be sure to have a great time – all while learning about the world we inhabit together. Register here. 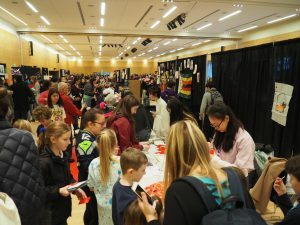 Dance Marathon, a student-led organization that raises funds and awareness for sick and injured kids in local children’s hospitals, will be coming to the University of Washington campus for the UW Huskython 2019, where it will be raising funds and awareness for the local Children’s Miracle Network Hospital, which treats children from our area and provides life-saving care to sick and injured kids in need. Create or join a team to participate in this year’s events! Join Danny Arguetty, mindfulness manager at UW, and The Whole U for an interactive seminar on self-acceptance. In this session, participants can dive deep within to unravel the self-sabotaging part of themselves that may be holding them back, learn to cultivate compassion for oneself and others, and develop strategies that will help you accept strengths and weaknesses. Register here. Tai Chi is an ideal aerobic exercise for any age and can be practiced for a lifetime. Tai Chi helps maintain spine health and increase bone density. It is beneficial to the cardiovascular, respiratory, nervous, and digestive systems, while also improving balance and the circulation of chi, an energy force that underlies traditional Chinese medicine and martial arts. These classes will help improve skills of self-centering, body relaxation, and slow breathing while practicing form movements, while increasing flexibility, leg strength, coordination, and balance. 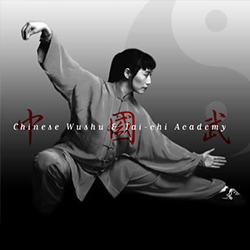 Yang Style Tai Chi, which gives in-depth, step-by-step instruction on the 24 form movements and Qigong warm-ups (12:00PM to 12:50 PM). Register here. Chen Style Tai Chi, which covers Chen Style Tai Chi Silk Reeling and Qigong warm-ups (1:00 PM to 1:50 PM). Register here. Learn how you can reduce your carbon footprint, the waste you produce, and your environmental impact in other ways – big or small! Join staff members from The Whole U, UW Sustainability and UW Recycling for this seminar by registering here. 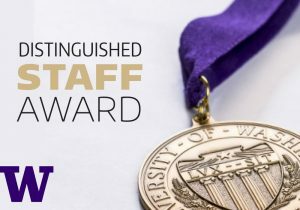 Celebrate the important contributions that UW Staff make across our campuses by attending the annual Distinguished Staff Awards reception. Hear from this year’s nominees for the highest UW staff honor, President Ana Mari Cauce, the award’s executive sponsor and Vice President for Human Resource Mindy Kornberg, and other campus leaders. Register here. 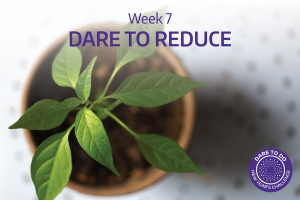 Combine mindfulness methods and fitness workouts with The Whole U and Peaceful Training founder Kal Broderick in our final week of our Dare to Do wellness challenge. After learning about how to integrate sample meditations and workouts into our daily lives, there will be a Q&A session, so come prepared with thoughtful questions! Register here. 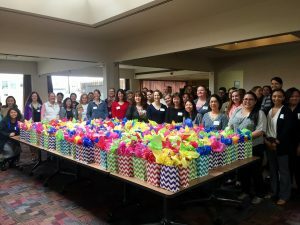 Bring a very happy birthday to less fortunate kids with The Whole U, the UW Combined Fund Drive and Cheerful Givers, a nonprofit organization that provides birthday gift bags to disadvantaged children. All gifts made will be donated to Mary’s Place in Seattle. The event will require a $15 minimum donation to cover the cost of the materials for the event. Register here. 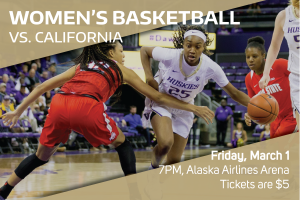 Cheer on Husky Women’s Basketball as they face-off versus the California Golden Bears in a Pac-12 conference showdown. Enjoy $5 tickets, courtesy of The Whole U and UW Athletics! Looking toward spring? 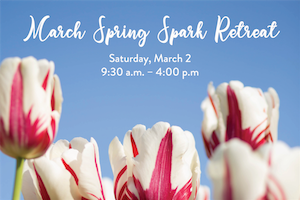 Explore and reset with a special retreat led by UW’s Mindfulness Manager Danny Arguetty on Saturday, March 2. 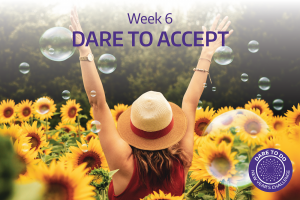 You will take time to welcome the new season, move your body, sit and contemplate, and awaken your creative spark to better support the months ahead! Attendance costs $55.00 plus a $8.58 UW processing fee ($63.58 in total). Register here.